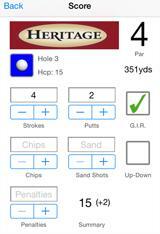 The only GPS enabled course / yardage guide for golf courses INCLUDING bunkers, hazards, tees, as well as the center, front, and back of greens. 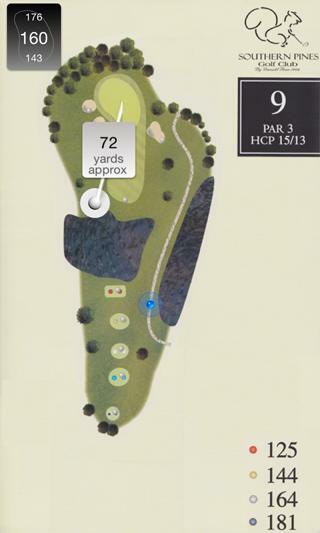 Course Guide GPS also allows you to track your score, total strokes, putts, chips, sand shots, as well as penalties. Plus it offers a host of benefits to golf courses. - Crystal Springs Golf Club, Burlingame, CA. 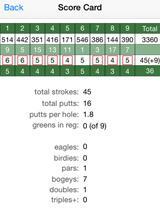 - Heatherwoode Golf Course, Springboro, OH. - Shoreline Golf Links, Mountain View, CA. Black HUD - Shows distances to the front, center and back of green. Blue Dot - Shows where you are. 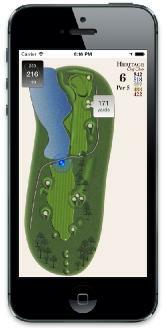 Gray Dots - Tap on one to show your distance to that hole object. Cart Path Only - Press & Hold where you think your ball is and get an approximate distance to the center of the green.